Although rodeo is considered to be Mexico’s national sport, it often takes a back seat to activities like fútbol. The Spanish word for rodeo is charrería, and charro horses provide an exciting experience for the spectators. 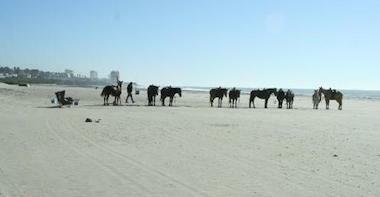 The idea of taking your own horse on a trip south of the border might be attractive. However, this can be a complicated process, especially if you will only be traveling in the country for a short time. Mexico is not the place for a quick trail ride in modern times, but if you are permanently relocating, the effort may be well worth your while. If you will be towing a horse trailer, you will need to include it as a towed item on your Mexico insurance for cars. You can get Mexican auto insurance for both towing and non-towing scenarios. To learn more about Mexico insurance for cars, visit the MexicanInsuranceStore website. It is important to have up-to-date health info related to a horse that will be imported. You will need to coordinate on both sides of the border as exportation of animals from the U.S. can be tricky as well. The USDA oversees regulations related to animal exports, and you will need to connect with an approved border vet. It is also necessary to verify the current requirements of Mexico for importation of livestock. As you import your animal, you will also need to import your vehicle and trailer in mainland. Vehicle importation is not required in Baja, but Mexican auto insurance is necessary. Border customs brokers may be helpful for handling both issues, and you will need your travel documentation as well as that of your horse. Additionally, you should have a copy of your policy. Pro Tip: Mexico insurance for cars is necessary to use the toll roads, so pick up Mexican auto insurance ahead of time! You can expect to be stopped and asked for travel tips more frequently with a horse trailer. Even if you are traveling with a horse, you should be aware that horse trailers can be used for illicit purposes in Mexico. This knowledge should dictate your conduct during any stops. Be respectful, and have patience with federales or police officers. Show your tourist permit, travel docs and policy as needed. Your Mexican auto insurance will guide your decisions about the type of coverage you want. Mexico insurance for cars at MexicanInsuranceStore.com gives you peace of mind! All over Mexico, there are various locals, cultures, activities and foods. This is so because Mexico is a diverse country. Is it true that if you’re involved in road accident, you will go to jail while being examined? I guess they need to figure out if you’re guilty or not?